Persimmon and Cashew Tea Cakes - Do You Know The Muffin Man? Notes: Very easy to make. I used some ripe Sharon fruit (a seedless Fuyu persimmon) in this. 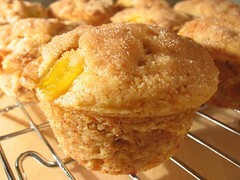 In the baked cake, the fruit chunks are bland, this would be better with mango or peaches. Anytime a recipe calls for dipping in butter then cinnamon sugar, I usually omit it, but I made the sweet crunchy coating this time and it's delicious.